This article is a translation-work in progress of the article Article 49 de la Constitution de la Cinquième République française from French to English. Article 49 of the French Constitution is an article of the French Constitution, the fundamental law of the French Fifth Republic. It sets out the political responsibility of the government (the executive power) before the parliament (legislative power). It is part of Title V: "On the relations between the parliament and the government" (articles 34 to 51). The article, which comprises four paragraphs, is designed to prevent ministerial crises like those that occurred in France under the Fourth Republic. Its best-known provision is the third paragraph (article 49.3), which allow the government to force passage of a bill without a vote unless the parliament votes a motion of no confidence to veto the government ("commitment of responsibility"). (1) Le Premier Ministre, après délibération du Conseil des Ministres, engage devant l'Assemblée Nationale la responsabilité du Gouvernement sur son programme ou éventuellement sur une déclaration de politique générale. (2) L' Assemblée Nationale met en cause la responsabilité du Gouvernement par le vote d'une motion de censure. Une telle motion n'est recevable que si elle est signée par un dixième au moins des membres de l'Assemblée Nationale. Le vote ne peut avoir lieu que quarante-huit heures après son dépôt. Seuls sont recensés les votes favorables à la motion de censure qui ne peut être adoptée qu'à la majorité des membres composant l'Assemblée. Sauf dans le cas prévu à l'alinéa ci-dessous, un député ne peut être signataire de plus de trois motions de censure au cours d'une même session ordinaire et de plus d'une au cours d'une même session extraordinaire. (3) Le Premier Ministre peut, après délibération du Conseil des Ministres, engager la responsabilité du Gouvernement devant l'Assemblée Nationale sur le vote d'un projet de loi de finances ou de financement de la sécurité sociale. Dans ce cas, ce projet est considéré comme adopté, sauf si une motion de censure, déposée dans les vingt-quatre heures qui suivent, est votée dans les conditions prévues à l'alinéa précédent. Le Premier ministre peut, en outre, recourir à cette procédure pour un autre projet ou une proposition de loi par session. (4) Le Premier Ministre a la faculté de demander au Sénat l'approbation d'une déclaration de politique générale. (1) The prime minister, after deliberation by the Council of Ministers, may commit the Government's responsibility before the National Assembly with regard to its program or, should the occasion arise, to a statement of general policy. (2) The National Assembly may challenge the responsibility of the government by passing a motion of censure. Such a motion shall be admissible only if signed by at least one tenth of the members of the National Assembly. The vote may not take place until forty-eight hours after the motion has been tabled; the only votes counted shall be those in favor of the motion of censure, which may be adopted only by a majority of the membership of the assembly. Deputies may not introduce three such motion in the course of the same ordinary session or more than one in the case of an extraordinary session, except in the case provided for in the following paragraph. (3) The prime minister may, after deliberation by the Council of Ministers, commit the government's responsibility to the National Assembly on the passing of a bill concerning financial matters or social security financing. In this case, the bill shall be regarded as passed unless a motion of censure, tabled within the succeeding twenty-four hours, is passed under the conditions laid down in the previous paragraph. The Prime Minister may also have recourse to this procedure for another purpose or item of proposed legislation within the session. (4) The prime minister may ask the Senate to approve a general policy statement. The Constitutional Law adopted on 21 July 2008 amended article 49 of the Constitution. The new text came into force on 1 March 2009. Before that date, the prime minister could use the procedure of paragraph 3 without any limit on all draft bills; since then, it can be used at most once per session, except for draft bills on public finances or the funding of Social Security (annual budget laws). According to a report by the National Assembly, section 3 may be implemented both during a regular session or a special session. In case of change of prime minister during the same session, the second will have this option even if the first has already used it. In addition, it may be used on several successive readings of the same text. "The difficult process of a motion of no confidence should temper the defect that is familiar to us and has been for too long. The motion of confidence is the weapon of the government, and it alone. Deputies can use only the motion of no confidence, and this is surrounded by conditions which are disputed only by those who do not want to remember. Experience has led, moreover, to provide a somewhat unique disposition to ensure, despite the maneuvers, the vote on an essential bill." "[...] the sovereign people, by electing the president, invests him with its confidence. In that post lie the core of things and the great part of the changes made. As a result, the government, appointed by the head of state and whose members, moreover, cannot be members of parliament, is no longer at all, vis-à-vis the parliament, what it was at the time when it proceeded only from the combinations of groups. Also, the relationship between the ministry and the parliament, such as they are governed by the Constitution, call for a motion of no confidence only under conditions that give this break an extraordinary seriousness. In this extreme case, the president, who has the responsibility to ensure the continuity of the state, also has the means to do so, because he may resort to the nation to make it the judge of the dispute via new elections, or a referendum, or both. So, there is still a Democratic way out." The first paragraph allows the prime minister to commit the responsibility of his government before the National Assembly by putting forward a motion of confidence. As stated in article 50, a negative vote (with a simple majority, in contrast to the two following paragraphs, which protect the executive to a greater extent) leads to a resignation of the government. Its meaning is sometimes imprecise, and therefore its interpretation is disputed, particularly concerning the obligatory or optional character of this commitment. In practice it is viewed as optional, and the presidential post retains a clear supremacy. Thus, the motion of confidence is an arm at the disposition of the government alone. The political benefit which it can obtain remains limited: even if the motion of confidence is still an important parliamentary tradition that can sometimes bring it advantages in its relation with the parliament as well as with the public opinion, a government not supported by a majority can abandon it without great inconvenience. The word engage (to commit, or to "make [something] an issue") in Section 49.1 is particularly subject to controversy. It can be interpreted as an obligation, typical of parliamentary regimes, or simply an option, a privilege of the separation of powers and the prerogatives of the president. Two other elements are subject to discussion but are of much less consequence: deliberation in the Cabinet (Conseil des ministres) and the distinction between a "program" and a "declaration of general policy". Parliamentary regimes customarily induct the prime minister or the government by the parliament or by the lower chamber of the parliament. For example, the Constitution of Italy states that "The government has to appear before each chamber no later than ten days after its appointment to get a vote of confidence" (94.3). The Basic Law for the Federal Republic of Germany provides for the election of the chancellor by the Bundestag (the lower house of the German parliament). The Constitution of the Fourth Republic of France also stated that "the president of the Cabinet and the ministers cannot be nominated until after the president of the cabinet has been invested with the confidence of the assembly" (article 45), and the practice of the Third Republic was identical. It is usual in French law for the simple present indicative to connote a requirement and not a simple option: "engage" means "must commit" and not "may commit". The word éventuellement ("possibly") in the declaration of general policy and the phrase peut engager ("may commit") in section 3 reinforce the obligatory nature of the commitment to a program, which lacks this phrasing. Nevertheless, the government exists by the order of its nomination through the president of the Republic (article 8), without reference to a possible investiture by the assembly. Article 20 makes clear, by referring to articles 49 and 50, that the president is responsible before the parliament, but the constitution does not attach conditions to any of his powers regarding his "commitment of responsibility", and even when it is required, no deadline is fixed to limit the obligation, which in reality is comes down to a moral decision. 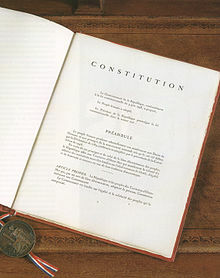 The interpretation of the clause as being optional is also that which Michel Debré made in front of the Conseil d'État, even before the adoption of the constitution: "the weapon of the government and of it alone". But in his first speech of general policy, he said on this topic that "the text does not say explicitly that he must do it, but the spirit of the Constitution is clear." This difficulty with regards to the connotation of the indicative mood is not the only semantic issue affecting the Constitution; one could bring up the debate of 1960 about article 29, "Parliament shall convene in extraordinary session, at the request of the prime minister or of the majority of the members of the National Assembly, to consider a specific agenda." and the quarrel in 1986 about article 13: "The president of the republic shall sign the ordinances..."
The text mentions the requirement of deliberation in the Cabinet, and the doctrine was questioned to find out if the term implied the agreement of the Cabinet or simply discussion, which would in that case leave the decision to the prime minister alone. The gouvernements have always spoken of authorization or of the agreement of the Cabinet. This phrasing has the additional advantage of solidifying the optional interpretation of the commitment of responsibility, since the prime minister could hardly be required to commit the responsibility of the government and prevented from doing it without the agreement of the Cabinet. The Constitutional Council validated the commitment of the responsibility of the government (in section 3) by the phrasing "to the extent that the Cabinet had deliberated [...] the commitment of responsility" without mentioning authorization. Since the gouvernements of the Fifth Republic had always been strongly united and superior to those of prior coalitions' gouvernements, the question of a possible disagreement between the prime minister and the Cabinet remains theoretical. In any case, this deliberation does not give the president, especially in a period of "cohabitation", the power to prevent the commitment of his responsibility, except in the improbable case of a refusal to enter the question on the agenda of the Cabinet. Lastly, there is the distinction between a "program" and a "declaration of general policy". If the former can be understood as a catalogue of the principal arrangements that the government hopes to make, probably as soon as it is established, in the logic of the investiture, and the latter as an explanation of its reasoning and of its intentions in a precise domain which would take—or to which the government would want to give—a particular importance, the distinction has no practical consequence. Certain prime ministers have used the expression "declaration of general policy" while they were speaking for the first time before the assembly. The Constitutional Council remarked incidentally that article 49 "tends to confer an analogous meaning"  to the two terms. De Gaulle in his Second Bayeux Speech (deuxième discours de Bayeux of 1946, when he explained his views on political institutions) did not want a parliamentary system, at least not in the monistic sense which had prevailed since the end of the 19th century: "It goes without saying that the parliament, which is composed of two chambers and which exercises legislative power, cannot be the source of executive power." As an important concession, however, which averted a strictly presidential regime, the head of state must "reconcile the general interest regarding the choice of the people with an orientation that is free from the parliament." The first governments of the Fifth Republic, those that set the precedent for later governments, committed their responsibility in front of the assembly after their appointment. They did this, however, always emphasizing that they proceeded from the president of the Republic and not the parliament, and that it was not an investiture. But after the presidential election of December 1965, Prime Minister Georges Pompidou, who became, once again, the head of a third government, waited for the opening of the common session of the parliament in April to present his program, making a simple declaration followed by a debate without a vote, and thus without a commitment of responsibility, although he had a solid parliamentary majority. Then, he stated that he wanted to create a precedent establishing the optional character of this commitment. After the general election of 1967, his fourth government had diminished to a narrow and uncertain majority, and he used the same solution. The simple language and the grammar [...] demonstrate in the clearest way that the prime minister has to commit the responsibility of his government to his program, and that this obligation, so decided, imposes itself upon him in a strict way. "[...] those who voted in favor would not be presumed to support the general policy of the government in any way." Lacking a guaranteed majority, it is preferable for the government to wait for a motion of no confidence described in part 2, the adoption of which is more difficult than a simple refusal of confidence. One category of government did, however, systematically require the confidence of, and almost investiture by, the Assembly upon coming into office: cohabitation governments. Those derive politically, if not legally, from the Assembly rather than from the President and must have its support; the regime thus functions in a more clearly parliamentary fashion. When introducing the motion of confidence in the National Assembly, the prime minister generally takes the opportunity to make an important political statement. This parliamentary ritual gives the motion some formality, which will be widely commented on by the media. For many years, it was the best format for making political policy speeches, that is, before the television interview appeared in its various forms offering alternatives. The speech is a mark of courtesy and deference to parliament. It allows the new prime minister to put forward his positions and pledge the soundness of his government. The refusal to make commitments is seen as an admission of the majority's weakness. Apart from the prime minister's nomination, the motion of confidence allows the government to deliver a new declaration on matters and events that may imposed themselves or on which the government wishes to give importance. On the other hand, under the Fifth Republic, it no longer possible, as under the previous Republic or regimes, to attach motions of confidence to votes of law to force the assembly to vote on the combined motion and the law. Under former practices, the government could link its continuance to the adoption of the legal texts. The Fifth Republic provides for a much more powerful weapon with the paragraph 3 (see below). The motion of confidence can also help the government in its relations with its majority in parliament. Voting on the motion can assure MPs worried about the unpopularity of their party if there is a clear victory in the National Assembly. It also can help rally MPs to stand-up to the opposition, and possibly force a critical coalition partner to renew its membership in the majority, as occurred with the RPR between 1976 and 1981 or the Communist Party between 1981 and 1986. However, the impact of the motion is often limited and does not often change the popularity of the government and its majority unless the prime minister delivers a highly successful speech. As for the reluctant coalition partner, it may vote to support the motion while expressing reservations and criticisms. In this regard, these reluctant MPs will become more bound by their vote since the text of the motion focuses on specific points, rather than on their general support of the government's policy, however, this does not prevent them from rejecting certain laws. Lastly, the approval of the motion by the assembly does not strengthen the ability of the prime minister to stand-up to the president of the republic. Prime Minister Jacques Chaban-Delmas requested and received the confidence of the assembly on 24 May 1972, while clearly reaffirming that the government took its legitimacy from the president of the republic, who may at any time put an end to its functions. (In reality, the president appoints the government, but the government can be withdrawn only on presentation of the resignation of the prime minister). President Georges Pompidou had given his agreement to this commitment, noting that it was the prime minister's prerogative. (Some time later, he said: "I was not in favor of that and that was known.") Five weeks later, he asked for and obtained the resignation of Chaban-Delmas. A vote of no confidence (censure) is a means for the National Assembly, on its own initiative, to force the government to resign. The vote's application and action by the parliament, in this regard, is an essential characteristic of any parliamentary system. De Gaulle, when inaugurated as prime minister under the Fourth Republic, promised he would include this procedure in the reform of the institutions. It was actually imposed by the Constitutional Law of 3 June 1958. In the constitution, the government's responsibility is framed by devices that allow it to streamline the parliamentarian system to promote stability of government. However, it is difficult to ascribe actual stability of the governments with these technical measures. The strength is due to two other factors. First, if a vote of non-confidence is approved by the National Assembly, the government, instead of resigning, is likely to ask the president to dissolve the assembly to stop it from voting. On the other hand, the Fifth Republic has been characterized by the appearance of stable political parties and reliable electoral coalitions able to effectively support the government. All these elements have reduced no confidence votes by parliamentarians. To date, censure has passed only once. Au contraire, par la menace de la motion de censure, la présence à l'Assemblée nationale d'une majorité hostile conduit le président de la République à nommer un gouvernement issu de cette majorité (« compatible », dit le discours de Bayeux), mode de fonctionnement des institutions nommé cohabitation depuis qu'il s'est produit pour la première fois en 1986 à l'issue des élections législatives. C'est alors ce gouvernement qui dispose de l'essentiel du pouvoir exécutif, et il peut s'appuyer sur sa majorité à l'Assemblée. L'article 49.2 impose donc la cohérence entre le gouvernement et la majorité parlementaire (pour autant qu'une telle majorité existe), caractéristique du régime parlementaire moderne, même si le chef de l'État y dispose de pouvoirs beaucoup plus étendus que dans les autres régimes européens. L'alinéa 2 s'attache, avec les moyens classiques du parlementarisme rationalisé, à rendre difficile tant le dépôt de la motion de censure que son adoption. Le but recherché est d'éviter l'instabilité gouvernementale et ainsi, « Qu'il existe un gouvernement qui soit fait pour gouverner, à qui on en laisse le temps et la possibilité » comme le dit de Gaulle dans son discours du 4 septembre 1958 Place de la République. Le dépôt est limité en imposant pour chaque motion de censure la signature d'un dixième au moins des députés, chacun ne pouvant en signer que trois pendant la session ordinaire de l'article 28 (avant la réforme constitutionnelle de 1995 sur la session unique, une seule motion pour chacune des deux sessions ordinaires de l'année), une par session extraordinaire de l'article 29. La portée de cette restriction est faible, l'opposition n'épuisant en général pas le nombre de motions autorisées. Sa conséquence la plus visible est s'il y a plusieurs oppositions, que les composantes les plus faibles (par example, le groupe du Front national entre 1986 et 1988) ne peuvent déposer de motion, faute d'atteindre la barre des 10% ; motion qui n'aurait eu de toutes façons guère de chances d'être adoptée. L'article s'attache aussi à compliquer l'adoption de la motion. Tout d'abord, un délai de quarante-huit heures doit s'écouler entre le dépôt de la motion et son vote. Lorsque le scrutin risque d'être serré, ces quarante-huit heures peuvent être mise à profit par le gouvernement pour convaincre quelques indécis de ne pas la voter. La constitution empêche ainsi le système de l'interpellation qui avait cours sous la IIIe République, lorsqu'un seul député pouvait « interpeller » le gouvernement, et la Chambre voter après débat un texte qui, lorsqu'il était défavorable au gouvernement, entraînait son départ. La Template:IVe République prévoyait déjà un jour franc entre le dépôt de la motion et son vote. Ensuite, en imposant un vote en faveur de la motion par la majorité des membres de l'Assemblée. Ce qui signifie que pour être adoptée, plus de la moitié des députés en fonction (on ne compte pas les éventuels sièges vacants, précise le règlement de l'Assemblée) doivent voter pour la motion. Le système ne laisse pas la place à l'abstention : un député peut voter la motion, ou ne pas la voter, auquel cas il est réputé ne pas souhaiter le renversement du gouvernement. On dit d'ailleurs qu'une motion qu'elle n'est pas adoptée, signifiant par là qu'elle n'a pas atteint la majorité, et non qu'elle est rejetée, ce qui voudrait dire qu'une majorité s'est déclarée contre ; or, seuls votent les partisans de la motion. Ce mécanisme, lors d'un scrutin serré, peut assurer la survie du gouvernement. La motion ayant échoué avec la marge la plus étroite visait la politique agricole du gouvernement de Pierre Bérégovoy en juin 1992. Il n'a manqué que trois voix à son adoption. La procédure de la IVe République était similaire, avec une nuance : si les partisans de la censure devait atteindre, comme aujourd'hui, la majorité absolue des députés, tous les députés prenaient part au vote, si bien qu'on pouvait distinguer les partisans du gouvernement des abstentionnistes ; bien que rien ne soit changé pour l'adoption de la motion, le vote pouvait affaiblir le gouvernement en mettant en évidence le peu de soutien don't il bénéficiait. Ces précautions sont encore renforcées par le caractère exclusif de l'article 49 quant à la mise en cause de la responsabilité du gouvernement. Le Conseil constitutionnel censure toute tentative, dans les lois organiques ou les règlements des assemblées, qui ouvrirait au parlement ou à une assemblée la possibilité d'un vote marquant sa défiance au gouvernement, fut-ce sans effet contraignant, en dehors de l'article 49. Ces diverses techniques de rationalisation se sont montrées efficaces pour ceux des gouvernements de la Ve République qui n'ont disposé que d'une majorité faible pour les soutenir. Cependant les mêmes techniques ou presque déjà présente dans la constitution de la IVe République avaient totalement manqué leur but. La plupart cependant n'ont pas été formellement renversés, mais se sont retirés faute d'obtenir le soutien qu'ils estimaient nécessaire, ou encore à la suite de désaccords graves entre ministres. Ces deux causes ont disparu. Les gouvernements des deux républiques précédentes (tout au moins après la chute de Mac-Mahon) devaient toute leur légitimité au parlement, le président de la République ne faisant guère que les proposer aux assemblées, auxquelles il devait d'ailleurs lui aussi sa fonction. Un soutien trop faible du parlement, même sans que la censure soit votée, les conduisait souvent à démissionner. Le président de la Ve République a sa légitimité propre et considère, hors période de cohabitation, que le gouvernement est le sien et est responsible devant lui, ce qui mène souvent à faire un parallèle entre la Ve République et les régimes parlementaires dualistes de la première moitié du XIXe siècle. La responsabilité devant le parlement subsiste, mais le gouvernement peut s'estimer légitime tant qu'il n'est pas renversé dans les formes. Si la censure est votée, elle peut s'interpréter comme un conflit entre les légitimités, toutes deux fondées sur l'élection, du président de la République et de l'Assemblée, conflit qui, explique de Gaulle, L'assemblée ne doit plus alors renverser le gouvernement qu'en raison d'un désaccord majeur, et le président de la République pour faire trancher le conflit de légitimité « peut recourir à la nation », en prononçant la dissolution de l'Assemblée nationale (article 12). Il s'agit d'un de ses pouvoirs propres, il n'y a aucune condition que de pure forme à sa mise en œuvre, et il a été effectivement utilisé la seule fois où la censure a été votée. La constitution veille d'ailleurs à interdire la censure lorsque la dissolution n'est pas possible, pendant la vacance ou l'empêchement de la présidence (article 7). La possibilité, voire la probabilité de cette dissolution peut avoir une forte valeur dissuasive sur l'Assemblée, beaucoup de députés risquant d'y perdre leur siège. En laissant à part les aspects dualistes propre à la Ve République, qui peuvent eux aussi contribuer à expliquer la solidité des gouvernements face à l'Assemblée, on a souvent remarqué les limites de la rationalisation technique du parlementarisme, celle qui repose sur l'introduction dans la constitution de mesures entravant le vote des motions de censures. Les premiers examples de rationalisation technique, qu'on trouve dans les constitutions rédigées à l'issue de la Première Guerre mondiale, notamment celle de la République de Weimar, elle aussi dotée d'un chef de l'État fort, ont totalement échoué, comme elles ont échoué sous la IVe République, ou encore dans la République italienne. En revanche, le parlementarisme britannique, totalement dépourvu de telles mesures, montre une grande stabilité. Cette stabilité est souvent attribuée au bipartisme, notamment par Michel Debré dans son discours au Conseil d'État ou encore par René Capitant, un des inspirateurs du régime, tous deux admirateurs du système britannique, fondé sur le scrutin majoritaire à un tour et le bipartisme. Bien que Michel Debré ait jugé sa transposition impossible en France, le scrutin majoritaire à deux tours, introduit en 1958 a abouti à des effets proches, avec des coalitions formées avant le scrutin et demeurant stables après. Lors qu'il ne relève que de la loi ordinaire (article 34), ce mode de scrutin contribue sans doute plus à la stabilité du gouvernement que le détail de l'article 49. On peut remarquer de même l'effet du changement de mode de scrutin en Italie en 1993, en l'absence de réforme majeure de la constitution, qui reste d'un strict parlementarisme moniste, d'ailleurs assez proche de celle de la IVe République. Cependant, le mode de scrutin ne garantit pas toujours l'existence de majorité, comme le montre l'example anglais dans les années 1920, ou encore la composition de l'Assemblée nationale entre 1988 et 1993. The censure was passed only once under the Fifth Republic, during the 4 October 1962 meeting (in reality on the morning of 5 October). The motion was filed on October 2, after General de Gaulle had announced on 30 September a referendum (in accordance to Article 11 of the Constitution) to organize the election of the President of the Republic by direct suffrage. The circumstances of that vote are quite specific, it occurred at the end of the Algerian crisis, which affected the first years of the Fifth Republic, a kind of transitional phase in its history. The vote took place during the first legislature of the Fifth Republic, and put an ends to it. The parliamentary elections of 1958 had not resulted in a clear majority, but the president and the Debré government could work with the assembly without a secured majority, because the priority was to resolve the Algerian crisis. In the summer of 1962, the crisis ended, and many of the deputies wished to revert to a more parliamentarian regime. De Gaulle, requesting the resignation of Prime Minister Debré, and appointing Georges Pompidou, a non-parliamentaryare, seemed not to go in this direction. The motion was passed easily, the Gaullist party UNR being the only major group not to vote it. De Gaulle was moving on 5 October and received on 6 October Pompidou announcing his resignation, as Article 50 forces him to do. De Gaulle took note of the resignation without formally accepting it, and requested the Government to remain in office, and announced the dissolution of the National Assembly on 9 October. De Gaulle won very easily the 28 October referendum and the parliamentary elections on 18 and 25 November. With this last vote, the left recovered from the 1958 elections in which there had been no alliance between socialists and communists. Conversely, centrist parties, popular and independent Republicans are defeated at the benefit of the UNR, which monopolized the rightist votes. That election, consequence of censorship of 5 October, put in place the polarization of political life in France. Pompidou's new government was appointed after the elections. The announcement of the referendum, which was preceded by few rumors in the summer, caused considerable excitement. The universal suffrage elections were to change the balance of powers, and would turn the election of the President of the Republic into a plebiscite, reviving the painful memory of Louis-Napoleon Bonaparte and General Boulanger. However it was the procedure which was under attack, because De Gaulle choose to revise the constitution with the Article 11 and not with the Article 89 which requires the consent of parliament. Most parliamentarians believe that the procedure is unconstitutional. This was also the opinion of most experts, by the State Council whose opinion was published in the press after a leak, by the Constitutional Council whose advice remains confidential, and by most of the entourage of the president, even the Prime Minister. The motion was clearly directed against the President of the Republic. La plupart de ses pouvoirs sont soumis à contreseing, ce qui dans la tradition parlementaire, justifie son irresponsabilité, le ministre qui contresigne endosse l'acte. L'article 11 échappe au contreseing, cependant on ne peut parler de pouvoir propre, l'initiative devant venir soit du gouvernement, soit du parlement. En l'espèce, elle est venue, bien que ce soit de pure forme, du gouvernement, ce qui permet la mise en jeu de sa responsabilité. Le texte de la motion ne laisse cependant aucun doute quant à sa cible, le gouvernement n'étant mentionné qu'à sa fin : « L'Assemblée nationale [...], Considérant qu'en écartant le vote par les deux chambres le Président de la République viole la Constitution dont il est le gardien ; Considérant qu'il ouvre ainsi une brèche par laquelle un aventurier pourrait passer un jour, pour renverser la République et supprimer les libertés ; Considérant que le Président n'a pu agir que sur la proposition du Gouvernement ; Censure le Gouvernement conformément à l'article 49, alinéa 2, de la Constitution. » Sa rédaction n'est pas loin de suggérer l'usage de l'article 68, la mise en accusation du président de la République pour haute trahison, plutôt que la censure du gouvernement. The clause 3 allows the government to impose the adoption of a text by the assembly, immediately and without a vote, that the assembly cannot oppose without toppling the government through a motion of no confidence (clause 2). This is one of the most known clauses of the Constitution, often cited as a mere number, "article 49.3" or even "the forty-nine three." This clause reveals a reversal of the relationship between governments and parliaments in the 20th century in favor of the former: the executive power is no longer subordinated to the legislative one and must be able to adopt laws in accordance to its policy. Various solutions have been implemented to ensure the ability of the government to pass laws. With article 49.3, the governments of the Fifth Republic are stronger than ever. The article allows the government to compel the majority if reluctant to adopt a text, and also to accelerate the legislative process, and in particular to end any obstruction from the opposition. Section 49.3 was conceived at a time when the parliament was often subject to divisions into numerous and undisciplined parties. This situation disappeared after the legislative elections of 1962. The new arrangement is more efficient, in that the legislators will prefer not to vote to force the resignation of the government even if they oppose the law in question, because they fear a form of political suicide in the eyes of the voters. when a need arises to accelerate a debate which is dragging on too long in relation to the necessities of the government calendar or when the opposition is trying to block the debate process by multiplying indefinitely amendment proposals, when the government enjoys a real majority and there is no surprise possible. The government includes the amendments which it considers most serious and important and begins the procedure of 49.3.
when the government is only supported by a plurality in the National Assembly (that is it has the support of the largest group in the Assembly, but less than an overall majority). Michel Rocard used 28 times the procedure to make his texts passed, because he was permanently torn apart between the PC, the center-right UDC (separated from the UDF), and deputies faithful to President François Mitterrand. Édith Cresson, who succeeded him, used it eight times, even if she benefited from a larger support from mitterrandist deputies. This article was originally translated from the French Wikipedia article, fr:Article 49 de la Constitution de la cinquième République française. ^ In 12 years (1946–1958), France went through 22 different governments—an average duration of six months per government—and 375 days of ministerial crises. ^ Texte de la loi constitutionnelle sur le site de l'Assemblée nationale. Voir en particulier les articles 24 et 46 de la loi. ^ De Gaulle refused to summon the extraordinary session by considering that article 29 gave him the option, and not the obligation, to do it. See his March 18, 1960 letter to the president of the National Assembly Jacques Chaban-Delmas, quoted in Maus, p. 176, 177, as well as in Chevallier, Carcassonne, Duhamel, p. 60 et 61. ^ In a period of "cohabitation" (when the president and the prime minister do not belong to the same party), François Mitterrand refused to sign some ordinances (decrees provided for in article 38 by which the prime minister, authorized by the parliament, may intervene in a domain relating normally to the law). In contrast to article 10 which fixes a period of fifteen days for the promulgation of laws, unanimously considered as an obligation of the president, article 13 does not set a deadline. See the televised interview of the president on July 14, 1986 and the prime minister's televised address on July 16, 1986, quoted in Maus, p 191 à 193, as well as in Chevallier, Carcassonne, Duhamel, p 335 à 337. ^ (in French)Décision du 29 décembre 1989, Loi de finance pour 1990, 89-268, au considérant 7. ^ Décision du 12 janvier 1977, Loi autorisant le Gouvernement à modifier par ordonnances les circonscriptions pour l'élection des membres de la chambre des députés du territoire Français des Afars et des Issas, 76-72DC, at the third "considering"
^ Georges Pompidou, Discours à l'Assemblée Nationale du 13 avril 1966. Qtd. in Maus, p 222. ^ Michel Rocard, Discours de politique générale du 16 janvier 1990, à l'Assemblée nationale. Chevallier, Carcassonne, Duhamel, p 390. ^ "Charles de Gaulle, discours Place de la République le 4 septembre 1958". le site de la fondation Charles de Gaulle. p. 4. Archived from the original on 2007-10-25. ^ donne à cette rupture un caractère d'extraordinaire gravité . ^ "Statistiques détaillées sur l'utilisation de l'article 49.3" (PDF). Archived from the original (PDF) on September 30, 2007. (42.5 KB) (site de l'Assemblée nationale). This page was last edited on 1 July 2018, at 16:07 (UTC).